When to use: Usually entered when market is near B and you expect market to fall slightly to moderately, but see a potential for sharp rise. One of the most common option spreads, seldom done more than 1:3 (two excess shorts) because of downside risk. Profit characteristics: Maximum profit in amount of B – A – net cost of position (for put-vs.-put version), realized if market is at A at expiration, or B – A + net credit of position (if long option premium is less than premium collected from the sale of two or more options). 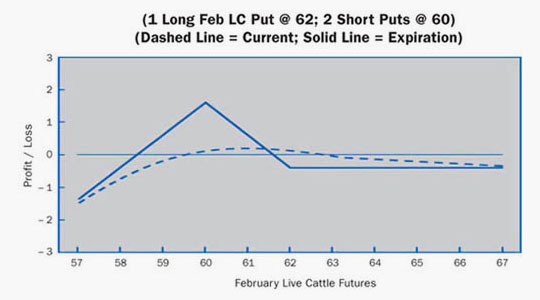 Loss characteristics: Loss limited on upside (to net cost of position in put-vs.-put version, or no loss if position established at a credit) but open-ended if market falls. Rate of loss, if market falls below strike price A, is proportional to number of excess shorts in position. 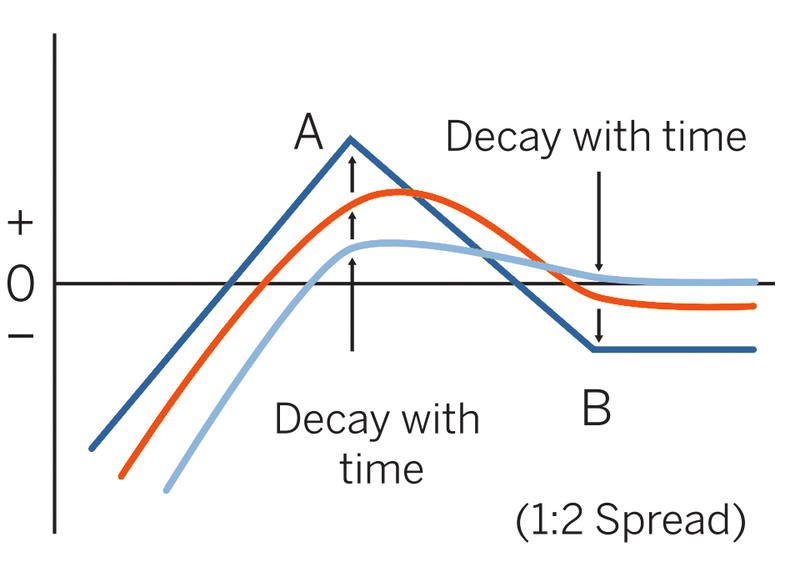 Decay characteristics: Dependent on the net time value purchased or sold via this strategy. If more time value sold than bought, then time value decays work to the benefit of the holder. This trader feels that current implied volatility is at relatively high levels. The thinking here is that the market should consolidate after its big drop. The trader now believes reduced volatility and a slow downward drifting of price are likely. Consequently, an order to execute a ratio put spread is placed with the broker. Breakeven: 58.375 (60.00 strike – difference between strikes + 0.375 debit). Loss Risk: Unlimited; losses continue to mount as futures fall below 58.375. Potential Gain: Maximum gain of 1.625 ($650) peaks at 60.00 strike. Be very sure that prices will not go into a sharp decline. But, if a slow drop is anticipated this may be a good strategy. A rally will produce a small gain or loss depending on the strikes chosen.